This fermented salsa recipe produces a tangy tomato sauce with strong flavour. No cooking is required. The ingredients. We'd run out of fresh chilis that day, so we used chili powder instead. Salsa packed lightly into a jar. Mix all ingredients together in the bowl with salt and (optional) spices; mix well! 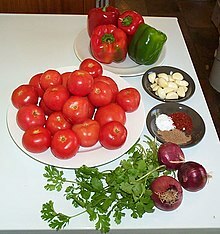 With the above fresh ingredients, there should be enough microbial load for the salsa to start fermenting by itself. Bubbles will begin rising to the top of the jar, showing that fermentation is under way - you should be able to see this through the side of the jar. Don't seal the jar while it is fermenting, as it will build up gas pressure and might break the jar. Just cover with a cloth, or cling-wrap. Sit the jar in a bowl or on a plate, so that any juice that might overflow will be collected and won't make a mess. If you are concerned that fermentation will not start by itself, you can add a starter culture. A good starter culture is a little juice from a recently fermented sauerkraut or kimchi, as this will bring across the necessary lactic acid bacteria and yeasts. The salsa will be fermented in two to three days. Wipe any excess liquid from around the jar, and put the lid on tightly before moving it to the refrigerator. It will last well in the fridge, but will continue to slowly ferment, getting more sour as time passes. Best within a few days, unless you like it quite sour! The salt used should be non-iodised salt if possible - e.g. pickling salt, kosher salt. This is because the iodine in iodised table salt will inhibit the fermentation a little. Use what you've got, but best results will be obtained without the iodine. Use fresh ingredients where possible; if you do use canned or dried ingredients, you may need to use a starter (see Fermentation, above). This recipe prefers to ferment at a temperature between 18°C-22°C (64°F-72°F). It will happily ferment outside that range, however if you want to keep it in that range, there are some tips available on the fermentation page. There is a suggestion on the talk page that more salt is required; read the discussion and decide for yourself, but traditional French recipes add no salt during the fermentation of crushed tomatoes. Salt volume recommendations made without specifying brand (and therefore grain size and shape) are not precise in any case. When handling hot chilis, use gloves or take extra care to keep your hands away from eyes and other sensitive areas even after washing them. This page was last edited on 10 June 2017, at 18:23.